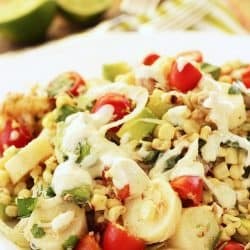 This grilled corn and crab salad is healthy, quick and easy to make, and perfect for a cool dinner on a hot summer night. Some people collect coins, or stamps. Or shoes. I collect cookbooks and recipes. Some of my cookbooks are purely functional – the tried and true ones that I can always count on for the perfect recipe or inspiration. I have lots of other books though, that I’ve picked up on vacations, and never made anything from. That’s probably weird for most people, but for me, it’s just a nice reminder of places I’ve visited and different cuisines I’ve tasted and special meals I’ve enjoyed. As a food blogger, I mostly use my cookbooks and the recipes I clip as inspiration to create my own original recipes (although some say there is no such thing as an original recipe) as much as possible. Unfortunately, that leaves me with files full of recipe clippings from magazines and website that I subscribe to, and so many other food bloggers that I follow, that I’m starting to drown in them, and again, most of them, I’ve never even tried to make. So, since it’s summer – I’ve decided to take a little vacation from developing my own recipes, and focus on creating and sharing some of the ka-jillions (sp?) of recipes from my files that are already developed and delicious. 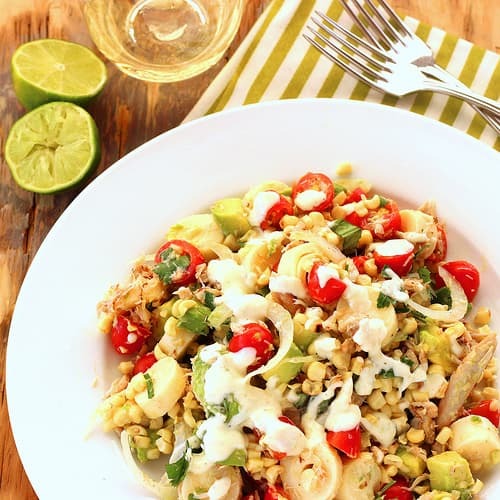 Let’s start with this gorgeous Hearts of Palm Salad that I clipped back in the spring of 2013, from Food and Wine. It’s probably perfect as it was written, but I tweaked it – ’cause that’s what I do – to include some grilled corn and crabmeat. Oh, and a bit of curry in the dressing, and if this doesn’t taste like summer, then I don’t know what does. 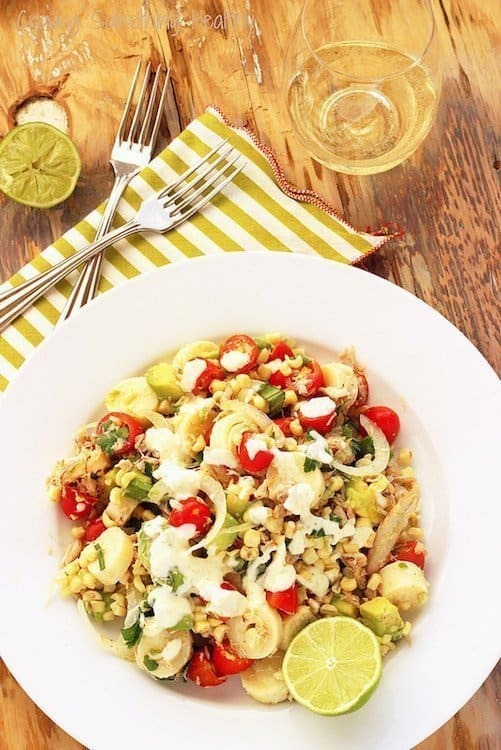 I’m loving this for a light summer dinner, or even a fancy luncheon. Make sure you buy good crabmeat for this. I’m talking jumbo lump. No imitation PLEASE! Here’s a question for you. Why are crab restaurants called “crab shacks” ? Are they really shacks, and if so, why on earth would pay good money to eat in a shack? Slice the corn from the cob, and place in a large mixing bowl. 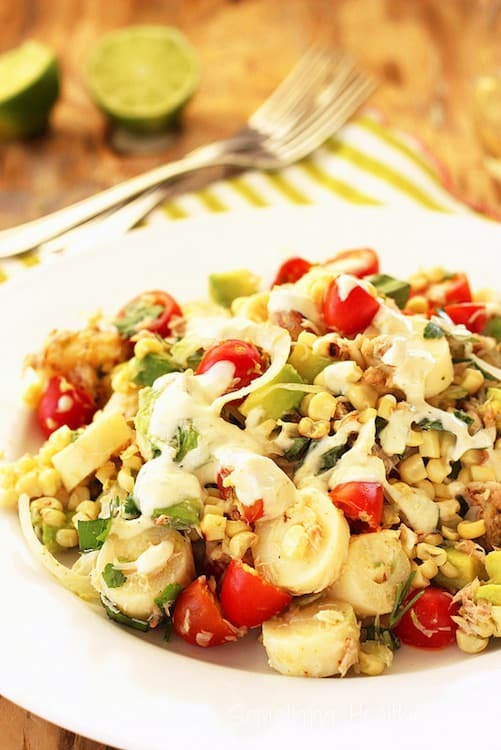 Add tomatoes, heart of palm slices, crab meat, avocado pieces, onions and parsley to the corn, and toss to combine. In a separate bowl or measuring cup, combine ingredients for dressing and whisk well. Pour dressing over salad and toss gently to combine. Do you collect recipes? How many do you get around to trying? Yes please!!! gotta love lump crab! I could eat this for lunch every day this summer and not get sick of it! So yummy! Ha ha! I’ll be right over to make it for you Katie! 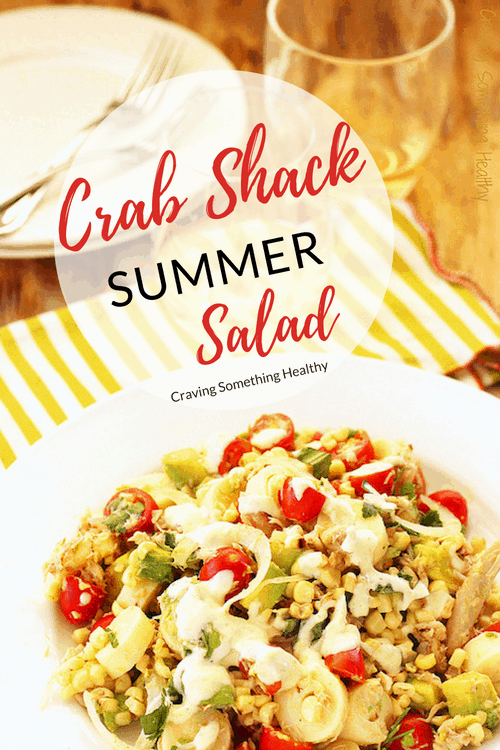 Summer salads are the best! So light and I adore all that seafood in there 🙂 Thanks for the recipe! I live on salads in the summer because it’s too hot to eat anything else here in AZ. Thanks for visiting!